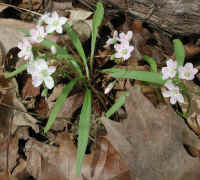 (Spring Beauty or Springbeauties (Claytonia virginica) - 01) A spring beauty can be identified by its long narrow leaves which spring forth near the ground around the central stock upon which the beauty of the flowers bloom in early spring. 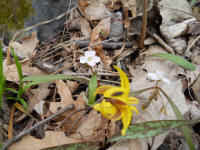 The flower of the spring beauty is only about 1/2 inch across. 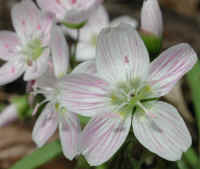 Spring beauties are another example of the glory of God's creation for all of us to enjoy and protect. 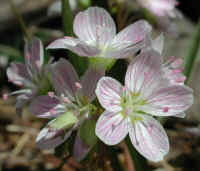 (Spring Beauty or Springbeauties (Claytonia virginica) - 02) The light and shadow adds to the interest of this ten times actual size photo (in enlarged version) of a cluster of flowers on a spring beauty. We all too often think of God as being all-powerful without seeing the gentle and delicate side of the Lord's nature which these beauties depict. To us, this is the way of God that should encourage us to hammer our swords into plowshares and our spears into pruning hooks and never again learn war (Isaiah 2:4). 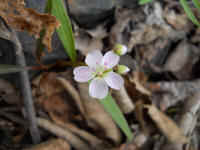 (Spring Beauty or Springbeauties (Claytonia virginica) - 03) The early flowering spring beauty does not end with the appearance of the first blooms. 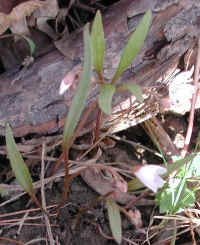 New beauties can be seen in various stages of budding from the upper left to the bottom center of this ten times actual size photo (in enlarged version). 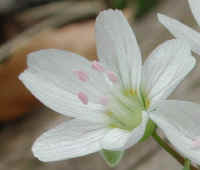 The flowers of the spring beauty close at night and on overcast and rainy days when insects are not flying so that its pollen will be available to propagate. This is just another of God's wonders depicted in His creation. 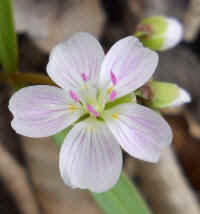 (Spring Beauty or Springbeauties (Claytonia virginica) - 04) In this twenty times actual size photo (in enlarged version), we can really come to appreciate the beauty of the spring beauties. 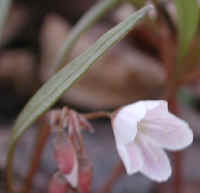 Each flower and each petal is unique; just as our human hands and fingerprints are individualized, so are the vein patterns in spring beauties. The Bible teaches us that God cares for each and every one of us as individuals. This wild flower should teach us that God cares about each and every one of His plants and animals, too. Let us resolve in our hearts and souls to love and protect the whole of God's creation (people, animals, and the environment) as our way of thanking God for all that he has given us, for our actions always speak louder than our words. 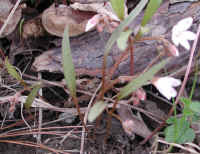 (Spring Beauty or Springbeauties (Claytonia virginica) - 05) In this photo, we can see the linear, tapered at both ends, spring beauty leaves. The leaves usually grow opposite one another, in a sweeping "Y", but as can be seen in this photo, sometimes they are solitary. (Spring Beauty or Springbeauties (Claytonia virginica) - 06) This photo gives us a closer look at one of the spring beauty leaves and an opening flower. (Spring Beauty or Springbeauties (Claytonia virginica) - 07) These spring beauties were hidden away under some bushes at the edge of the woods. 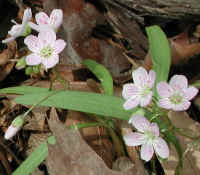 (Spring Beauty or Springbeauties (Claytonia virginica) - 08) This is another view of the spring beauty leaves and flowers that were growing by the edge of the woods. (Spring Beauty or Springbeauties (Claytonia virginica) - 09) We spotted this cluster of spring beauty wildflowers growing in the woods where they could take advantage of the spring sunshine before the tree leaves had fully opened. We believe that this is one of the reasons why these plants have so many flowers. (Spring Beauty or Springbeauties (Claytonia virginica) - 09a) This photo gives us a closer look at some of the spring beauty flower clusters. Note how many buds are also present. 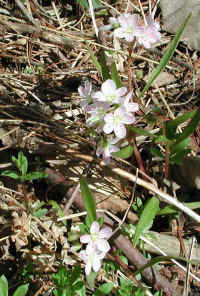 (Spring Beauty or Springbeauties (Claytonia virginica) - 09b) This is another cluster of spring beauty flowers. 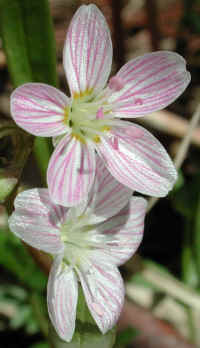 (Spring Beauty or Springbeauties (Claytonia virginica) - 10) We always marvel at how much beauty God designed into even his small creations. The spring beauty is truly appropriately named. (Spring Beauty or Springbeauties (Claytonia virginica) - 10a) In this bee's eye view of the center of a half-inch spring beauty flower, we can see the five stamens splayed out over the center of each of the five petals and the pistil growing straight up from the center, with its three-sectioned stigma spread to receive the pollen grains. 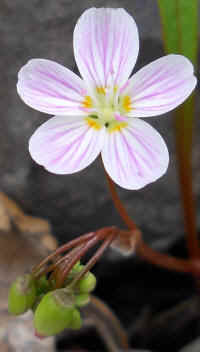 There also appears to be a tiny insect, partially hidden, in the center of the spring beauty flower. 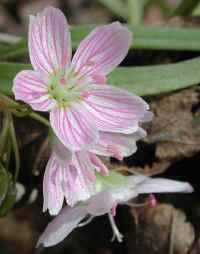 (Spring Beauty or Springbeauties (Claytonia virginica) - 11) In the center of this spring beauty flower is a tiny insect, no more than 1 millimeter long, climbing up the filament of a stamen. Even the smallest of God's creatures can enjoy the beauty of His creation. (Spring Beauty or Springbeauties (Claytonia virginica) - 12) From the side view of the top right spring beauty flower, we can see that when newly opened the stamens are longer than the pistil; but as the flower matures, the stamens lie back against the petals, leaving the pistil standing high in the center, as can be seen in the side view of the left flower. (Spring Beauty or Springbeauties (Claytonia virginica) - 13) In this bee's eye view of the center of a mature spring beauty flower, we can see how the stamens bend over against the petals, leaving only the pistil standing upright. 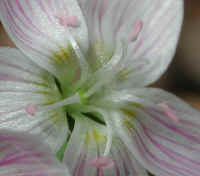 (Spring Beauty or Springbeauties (Claytonia virginica) - 14) In this greatly enlarged photo of the center of a spring beauty flower, we did our best to focus upon the anthers at the tip of the stamens, in order to view the pink colored pollen grains. Usually, pollen grains are yellow. 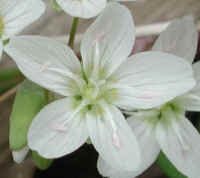 (Spring Beauty or Springbeauties (Claytonia virginica) - 15) More of the spring beauty's beauty! 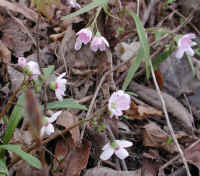 (Spring Beauty or Springbeauties (Claytonia virginica) - 16) This is another cluster of spring beauty flowers that are growing on the plant's loose raceme. 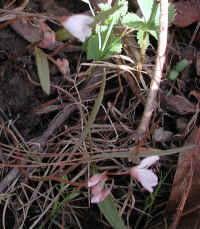 (Spring Beauty or Springbeauties (Claytonia virginica) - 17) This is a patch of spring beauty flowers that are just beginning to open. 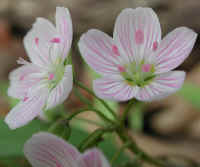 (Spring Beauty or Springbeauties (Claytonia virginica) - 18) These spring beauty flowers are white with pale pink veining and with some pink coloration in the anthers on top of the stamens. 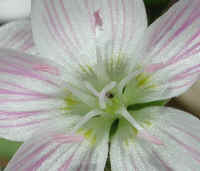 (Spring Beauty or Springbeauties (Claytonia virginica) - 18a) This is a bee's eye view of one of the white spring beauty flowers that has very little pink coloration. Even the yellow center is lighter in color. 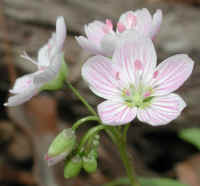 (Spring Beauty or Springbeauties (Claytonia virginica) - 19) This white spring beauty flower has a little more pink coloration than the previous flower we looked at, as noted by the slightly darker veining and the tinted anthers. 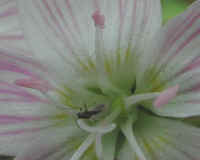 At the bottom of the photo, we can also see one of the two sepals projecting from under the flower. 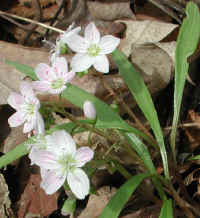 (Spring Beauty or Springbeauties (Claytonia virginica) - 20) On 24 April 2011, while on one of our walks, we spotted some spring beauty wild flowers growing in the woods just off the road. This is one of them. 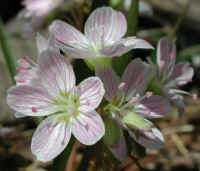 (Spring Beauty or Springbeauties (Claytonia virginica) - 20a) This is a closer look at the previous spring beauty and a cluster of flower buds. 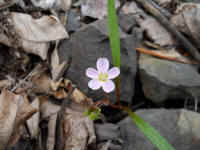 (Spring Beauty or Springbeauties (Claytonia virginica) - 21) This is another one of the spring beauty flowers we spotted in the woods. Note the buds that are just beginning to open. 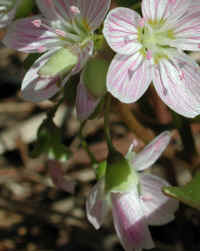 (Spring Beauty or Springbeauties (Claytonia virginica) - 21a) This is a closer look at the previous spring beauty. 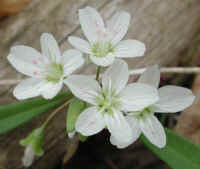 (Spring Beauty or Springbeauties (Claytonia virginica) - 22) These are some spring beauty wildflowers growing with adder's tongue. The mottled two-tone green leaves belong to the adder's tongue.